Light therapy boxes are incredibly useful tools that provide a wide range of benefits to seniors from improving mental health to increasing your overall sense of wellbeing and happiness. These lamps simulate natural light in situations where you may not have it. A light therapy lamp provides natural light to rooms that have no windows, but they also offer light to people who live in areas that may not receive an ample amount of sunlight. This includes most northern states above Maryland. In this article, we are reviewing the best light therapy lamps and how their use can impact your life and the life of your loved ones who are aging in place. 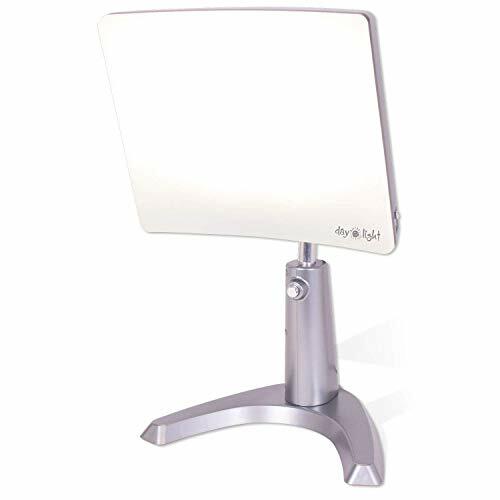 Why Should You Use A Sunlight Lamp Or Light Therapy Lamp? This highly recommended therapy lamp is a great option for its transportability and its simple to use features. We chose this light as our best overall because it is portable, so you can use it anywhere and it is light enough for easy transport. This is an excellent option for people who seniors who spendthe majority of their time inside or who may not have access to a lot of natural light in their living situation. The light is bright and can be used for extended periods of time. It is an excellent option for senior citizens because it provides comfortable, safe light therapy that can improve your mood and combat common sleep issues. Constant exposure to unnatural lighting is common in seniors because they may not get outside enough due to limited mobility, injury, or illness. Having an artificial source of natural blue light can improve their quality of life and even reduce dementia symptoms. Our runner up is a great choice because it offers three adjustable brightness settings and its overall appearance is eye-catching in any setting. This therapy lamp is appealing and looks nice once it is set up. This has a 10,000 LUX, so it is incredibly bright and may help seniors with seasonal affective disorder, depression, and sleep disorders. when there is no natural light in your room or your living area. 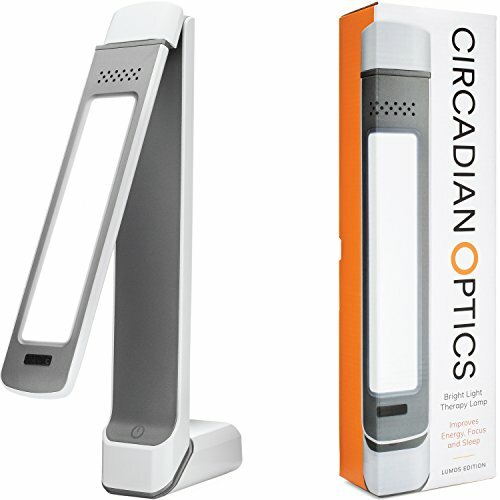 This lamp comes with three adjustments that allow you to set different levels of brightness which is nice for aging adults who may be sensitive to incredibly bright light or could benefit from the extra light to reduced eyesight. . Also, not everyone is going to require the same amount of light to feel the effects, so it is important to have the ability to adjust it. It also comes with a three-year warranty. This product’s ease of use also make it an ideal option for aging adults and seniors. The button and interface is incredibly simple to use and the brightness adjustments are also simple and just require an additional tap to adjust. 2019 MODEL UPGRADES | IMPROVED ADAPTER - To further improve reliability and durability. This is a beautiful and modern looking lamp that provides the same benefits of the previous products. 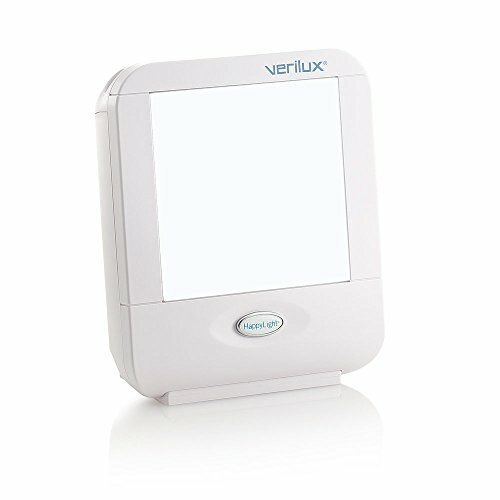 It has a bright 10,000 LUX setting to help with seasonal depression, sleep disorders, and fatigue, issues that commonly plague the elderly and diminish their quality of life. This is a great option for people who are on melatonin to help with sleeping issues. The light is free of UV rays, and it offers three different brightness settings which means that it can be adjusted for your individual comfort and needs. This therapy lamp also comes with a three-year warranty.. 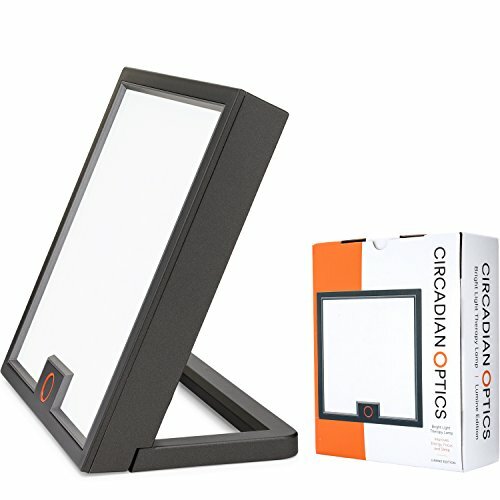 In the event that you have an issue, Circadian Optics have an exceptional customer service team that works to solve any problem you may experience. 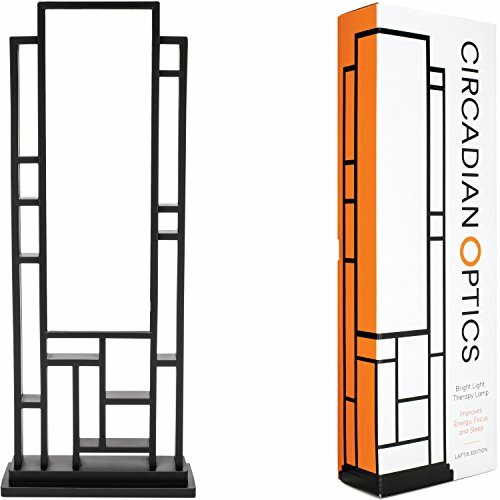 These glasses are unique because they can be worn over your existing glasses as you are proceeding through your daily routine. They do become bulky and get in the way at times though. These light therapy glasses are ideal for active seniors since you can wear them throughout your daily routine. If you tend to get up early in the morning before it is light out, these glasses illuminate your surroundings with blue-enriched white light to help you feel energized and happy. They come with three different settings and can be worn over existing glasses so you can wake up, put them on, and go about your day. These glasses are rechargeable, and they charge easily using a USB cable. One full charge gets you six sessions which is 20 to 45 minutes. We felt the impact of wearing these glasses almost immediately. There is a boost in energy and overall well-being but wearing the glasses for too long can become cumbersome, so keep your sessions short and comfortable. This therapy lamp is a great option for people dealing with seasonal depression or if you are in a room with limited sunlight. This small and compact bright spectrum light is an excellent option for seniors who suffer from seasonal depression or live in an area with limited sunlight. The bright light simulates natural sunlight with can have a variety of positive health effects from improving mood to helping regulate your circadian rhythm. This light has 3 hinges so it can be positioned so it can positioned in just about any direction you like. This is one of our favorite lights because it comes with an alarm and it mimics sunrise and sunset. There is not much better than waking up to a natural sunset every morning but this lamp definitely does a good job at mimicking it. 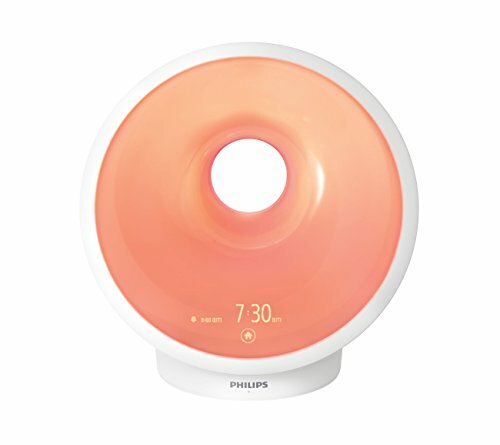 This therapy light from Philips has a lot of unique features and is an excellent choice for seniors who have a bedroom without many windows. The goal of this light is to simulate a natural sunrise when you do not have any natural light in the room. You set your alarm to the time you want to get up, and the light gradually rises like the sun until the alarm goes off and at that time the light should be at a full sunrise. The point of this light therapy lamp is to improve your overall mood and energy level when you wake up by tricking your biological clock. It also has a sunset feature that performs the same way. This product is clinically proven to improve mood, energy, sleep, and wellbeing making it an excellent choice for seniors who often suffer from issues related to anxiety and depression. 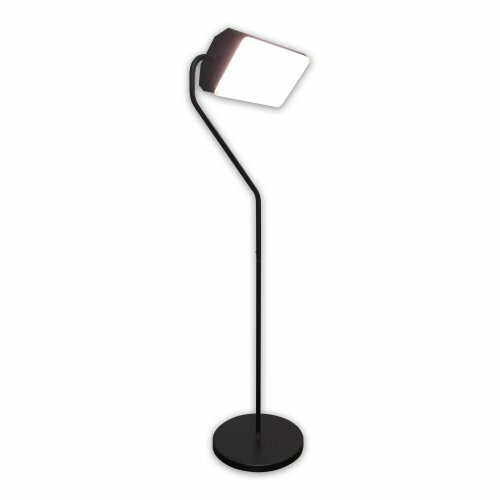 This floor lamp offers 10,000 LUX and extends light out for 12 inches. The lamp itself is four feet tall and gets powered by an electronic ballast. The lamp uses specialized UV coated fluorescent light bulbs that are only available from the manufacturer. This floor lamp offers 10,000 LUX and diffuses warm light out for 12 inches, which is comfortable and easy on the eyes The lamp itself is four feet tall and gets powered by an electronic ballast. Because it can sit on the floor, it is ideal for seniors to use in lighting a variety of rooms in the home. The bright light it emits is perfect for activities like knitting or reading and it provides the same positive effects on mood, sleep, and wellbeing that other therapy lamps do. The lamp uses specialized UV coated fluorescent light bulbs that are only available from the manufacturer. In comparison to a lot of the other lampswe have reviewed, this is one we would recommend for a larger room because it does not have adjustable settings and it throws off quite a bit of light. If you were to use this in a small room, you may find the amount of light to be excessive. This lamp is a treatment for Psoriasis, Eczema, and other skin disorders. By hovering the lamp over the affected area, it is known to clear up your skin. Effect is fast, and curative effect is obvious. 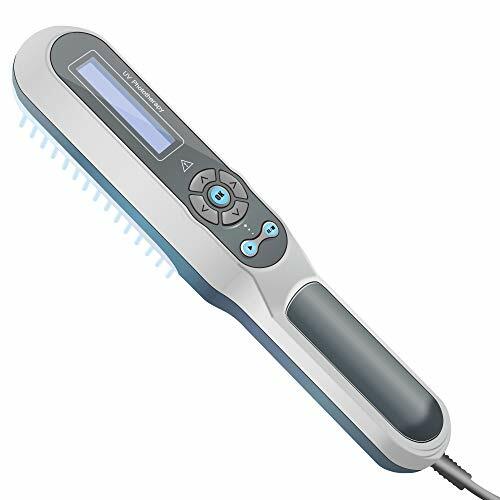 This handheld therapy lamp has a different purpose than the previous lamps we have reviewed. This lamp is a treatment for Psoriasis, Eczema, and other skin disorders. By hovering the lamp over the affected area, it is known to clear up your skin. This may prove to be very therapeutic and comforting for a senior whose quality of life suffers as a result of these conditions. Using this method to relieve the skin disorder symptoms is an incredible alternative to adding more pills and treatments to a senior’s daily regimen. This strategy is something they can do themselves in their free time, thereby enhancing feelings of independence and self-reliance. It is highly recommended for the treatment of these issues however there is very little instruction on how to use it with the package. This mood light is incredibly useful and often a life changer for people who deal with seasonal depression and lack enough sunlight in their life. This mood light is incredibly useful and often a life changer for seniors who deal with seasonal depression and lack enough sunlight in their life. If you live in an area that does not have an ample amount of sunlight or your living conditions do not provide you with that, then this is a great option. Something we really liked about this lamp is its adjustability. The top of the lamp swivels in many different directions and also goes up and down to fit a variety of situations. Natural white light is incredible and has the ability to help seniors aging in place with issues that affect them disproportionately, like depression, anxiety, and sleep deprivation. When compared to mood correction pills and other methods of helping the elderly feel more energized, therapy lights such as this provide a safe and healthy alternative. ,. The lamp is large and throws off a lot of light at 10,000 LUX, so you do not want this light in a small area, or it could be irritating. You know that light therapy lamps are useful for Seasonal Affective Disorder or seasonal depression but what if you don’t have that? Could a sunlight lamp still be helpful to you? Our answer is yes and we’re here to tell you why. Seasonal Affective Disorder is also known as seasonal depression, and this often happens due to the drastic decrease in sunlight during the winter months. Some people have even claimed that they experience this issue during the summer months because they prefer winter over summer. There is no definitive treatment for seasonal depression, so doctors often prescribe light therapy to trick the chemicals in the brain to think there is more sunlight than there is. For seniors who don’t get out of the house often due to limited mobility or poor health, this could be a life changing product. Therapy lights are also suitable for general depression that is not due to a change in season. It works similarly by tricking the brain into thinking there is additional sunlight. When we have an overexposure to artificial light, it tends to affect our mood, and that is why a walk through nature sometimes feels so good. Similarly, the therapy light improves your overall mood the more you are exposed to it, and if you follow consistent treatments and stick to it, it can relieve symptoms of depression. When your mood is improved, you often experience increased energy and a better quality of life. When you are enjoying life, you tend to have more energy to get through your day and that can be incredibly beneficial to seniors experience fatigue and listlessness. This is also a great option if you do not have enough exposure to sunlight because your living conditions do not allow it. If your bedroom does not have windows or you live in an area that experiences long periods without sunlight, this is a perfect solution. In some cases, skin disorders like psoriasis are treated using light therapy directly on the affected area. We reviewed a portable light therapy lamp above that is intended for this use. By addressing the affected area consistently on a daily basis with the light, it is known to improve symptoms of common skin disorders. This method is a great alternative because it is something the user can do on their own time by themselves with little assistance. It does not require them to get up and go anywhere or take any additional medication. Using white light in this way can drastically improve a senior’s quality of life. Depression, seasonal affective disorder, and sleep problems tend to effect the elderly disproportionately, which is why light therapy can be a great option. By simulating the sun’s natural light, you can reap the benefits you would get from exposure to the sun in the comfort of your own home. Light therapy is a simple, cost-effective way for seniors to boost their overall health and wellbeing and we hope the information we’ve compiled helps you find a product that suits your individual needs.